When you group shapes or pictures, you effectively join them so you can move and format them as a combination. For example, you can rotate, flip, move, or resize shapes or pictures at the same time as though they were a single object. 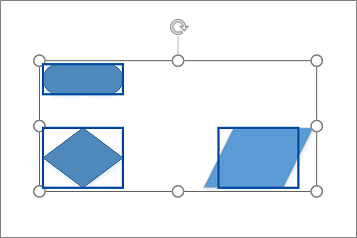 You can also ungroup a group of shapes or pictures so you can make changes to a single shape or picture. Then if you want, you can group them again. Select two or more shapes or pictures. Select Shape > Group > Group. From now on, when you select one of the objects in a group, a selection box surrounds the grouped objects. Select the group of shapes or pictures. A selection box surrounds grouped objects. Select Shape > Group > Ungroup.